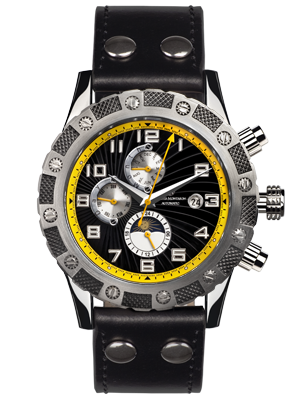 We put several Mathis Montabon watches to the acid test. The Le Général passed all our tests with flying colors. 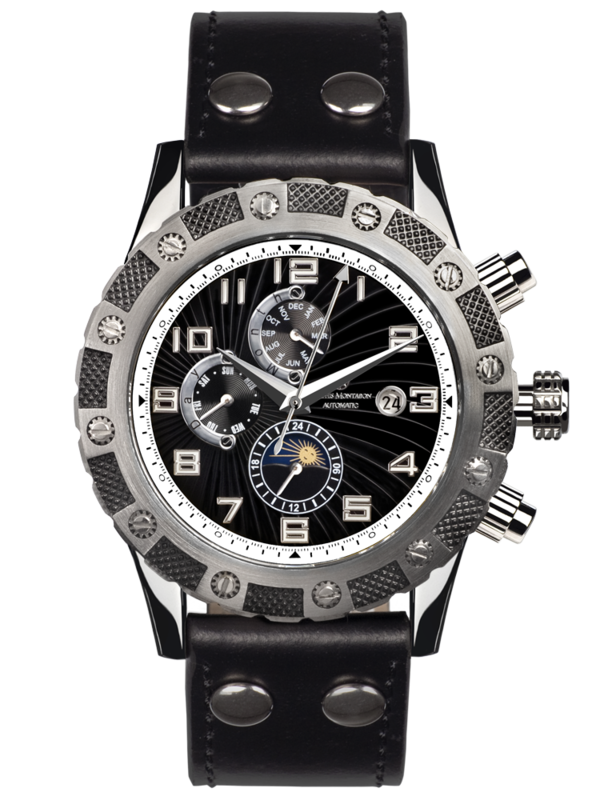 The name Mathis Montabon stands for high quality luxury watches, precision and durability. Only top-quality materials were used for the fabrication of le Général. The stainless steel watch case has an impressive size. 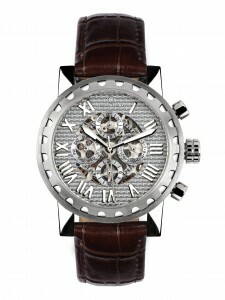 The watch case has a diameter of 47mm and a height of 15mm. The watch is equipped with scratch proof sapphire glass. 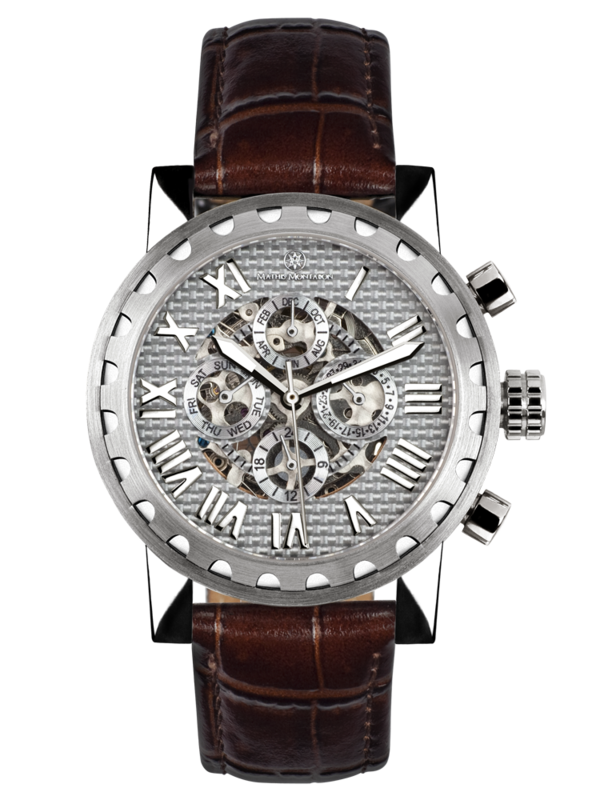 The movement Mathis Montabon Kaliber M-3 with 21 stones is a durable and high-quality automatic movement. The dial shows a display for the day / month, a 24h display and a sun/moon disk. The real leather wristband is soft and feels comfortable on the wrist. The watch is waterproof up to 5 atm. The collection includes four different styles with white, red, blue or green colored second hands and a minute ring in the same color. The price of our test model is 1.420 EUR. 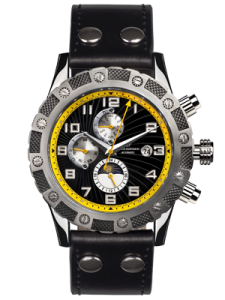 That’s an adequate price for a high quality watch that successfully combines functionality and design. The Mathis Montabon´s Squelette silver has fascinated us a lot, for this reason a test was a must! Mathis Montabon is a producer of high quality luxury watches, so we were obviously very enthusiastic about the results of our tests. These can be read here in our test report. Have fun! 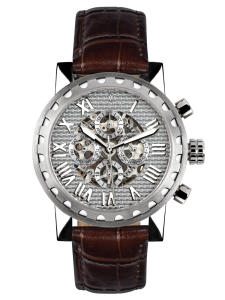 The Mathis Montabon´s Squelette silver has also a nickel-free stainless steel box and a comfortable leather bracelet. Naturally this watch, that belongs to this price range, precludes an automatic caliber (M-5) – 21 stones ensure the necessary quality. The scratch-resistant sapphire glass protects the indicators of date, day, month and 24 hours. 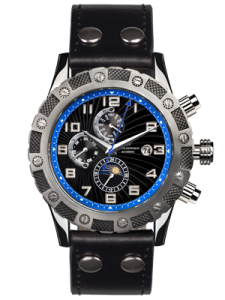 The sale price is € 1390 and is located in the middle segment of the luxury prices. Our first impression was really good. A nice box created suspense when the Mathis Montabon´s Squelette silver arrived. Then inside you get to the object of desire, which shines in contrast with the dark box and naturally the effect of surprise can only increase. In the box there are the full manual of instructions and the guarantee of plastic that looks like a credit card. The first impression is so and we can only hope that we can keep longer the watch, especially when we have the object only for a short test and then we must return it! (Swimming, sweat, etc..). The mathis doesn´t satisfy only sufficiently all these criteria but rather it fulfills them almost perfectly! We recommend Mathis Montabon´s Squelette silver and we hope we have shown its characteristics clearly and understandable. If you have any questions about our services and above all of this text is enough write a comment. We were so glad to to test for you this watch! The La Magnifique reached us beautiful packaged in a pretty looking watchbox with guarantee cards. The watch is very nice and is in nature almost more beautiful as on the photos. 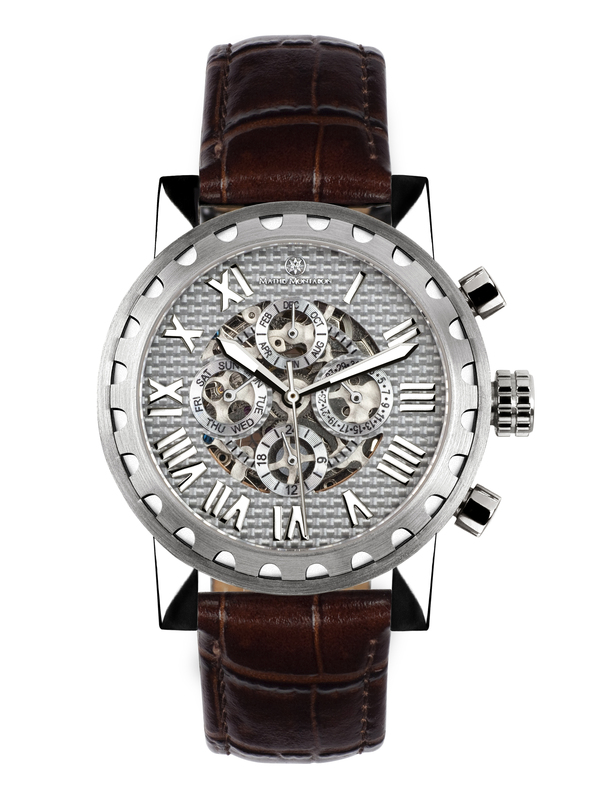 This graceful model is absolute succesfully designed by the swiss watch manufacturer. The number dial leaves a significant and nobel impression. It is beset with three real diamonds.On the lunette twinkle zirconia stones about the bet. The beautiful manufactured strap consists of a well done mix of stainless steel and robust ceramic.The watch feels comfortable on the arm. 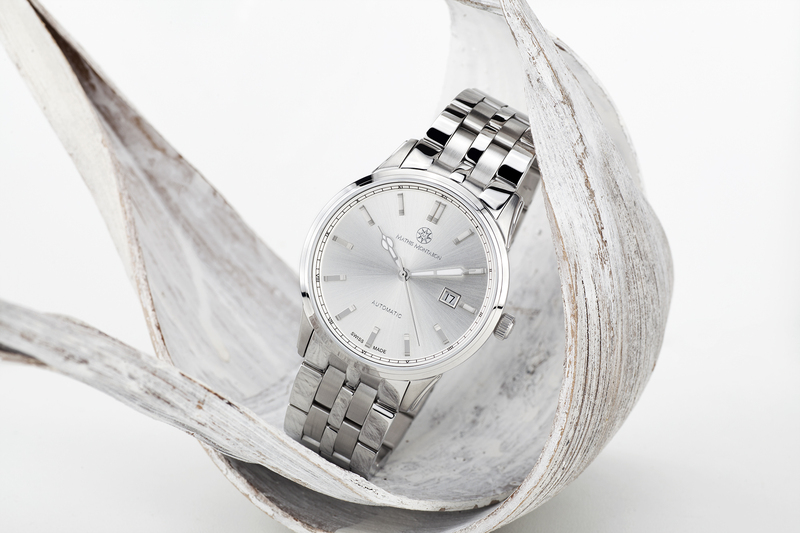 The stainless steel case has witch 43 mm (without crown) a comfortable size. It appears assiduously manufactured. You can’t find any scraches or something similar on our test watch. 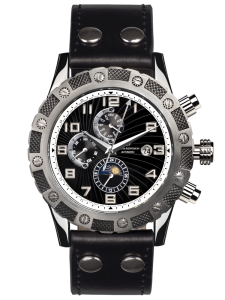 The heart of this model is the automatic clock unit “Mathis Montabon caliber M-1100” with 22 stones. In daily use we couldn’t find any output deviations. For comfort in daily use cares the water resistance of 5 bar. So it can also be worn when hand washing or taking a shower. Altough you are tempting to wear the watch only to special causes, it endures – thanks to the saphire glass and robust stainless steel/ceramic-mix – all daily situations. Because the indicator is added with luminous material, you also can read the time easily in less light. There are different colours variations with black or white with rosegold and silver. Also variations without circonia stones on the lunette are available. We are pleased about the “little black” by Mathis Montabon. Design and technic convinced us from the beginning. A designerpiece, which also endures our everyday test. We are excited. 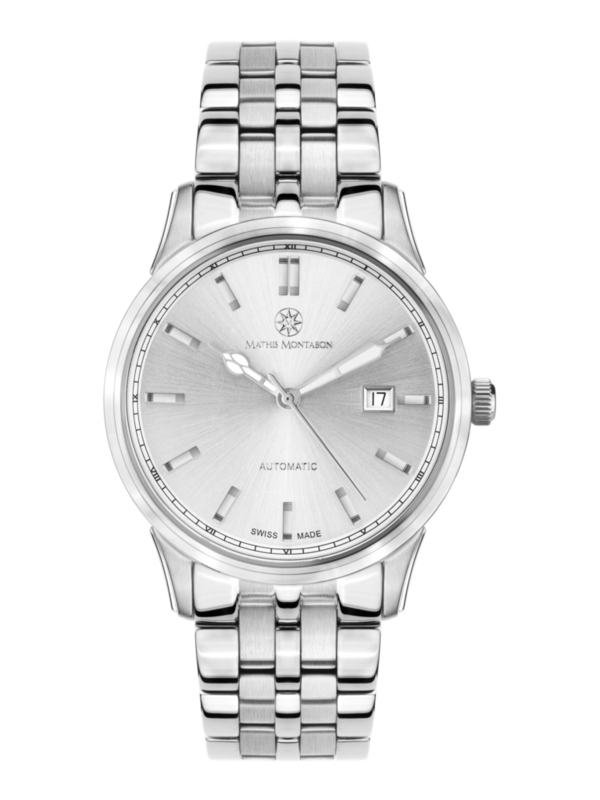 We would like to present you a new Mathis Montabon´s model,that captures our attention with its attractive design. We are talking about the Mathis Montabon´s Grande Date black-red.We found this model particularly attractive and therefore we would like to introduce it also to you. Of course you can also count on a test when we have an equivalent test object! 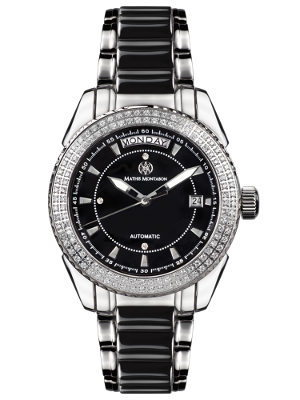 Today we would present an alternative women´s watch – the Mathis Montabon´ s La Magnifique silver Zirkonia. This watch has a stainless steel bracelet and a nickel-free box. The dial is white and it is secure under the high-quality sapphire glass. Sapphire is the material used to protect against scratches. It is characterized by exceptional sharpness and durability. 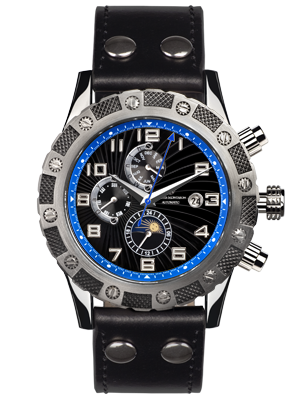 Unfortunately, it is found only in watches costing more, because the material is more expensive than mineral glass. 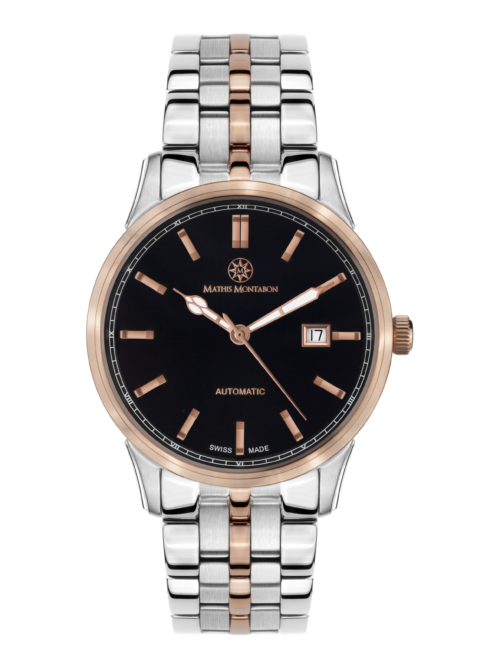 The automatic movements are the work of the mechanical watches that goes forward through the movements of the same wrist. That’s why these luxury watches are considered modern masterpieces. Blued screws / pointers are an original aspect. The color blue is a metal finishing process that protects against corrosions. This process is also done in the armor and swords! So Mathis Montabon Squelette Silver combines many features. For this reason Mathis Montabon can require a certain price. But these watches are more than timepieces, they are status symbols, helpers, and finally an investment. The price is only the second violin, though when you buy a watch like this contains all these qualities.